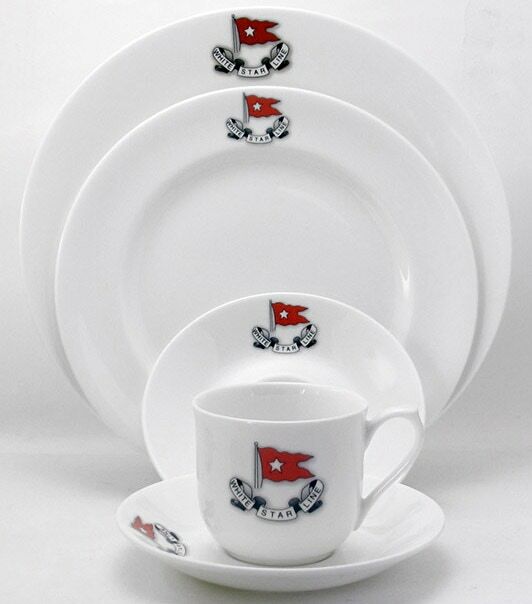 Specially printed bone china plates decorated with enamel screen printing or full colour prints are ideal for anniversaries, publicity and promotions, award and competition prizes, conference awards, best restaurant and food awards as well as commemorating historical events and armed services anniversaries. 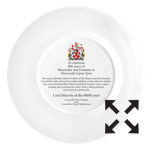 These printed bone china plates are of high quality and can be printed in a variety of ways - the centre, centre and rim, as well as on the back with a special commemorative text and limited edition numbering. See below for examples. Two styles of plate are available, shoulder style - left which is a plate with a rim, and coupe - right, without a rim. 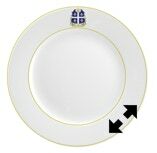 The cross sections of each plate, top, the shoulder style and below, the coupe style. 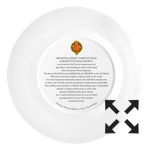 The plates can be decorated in a variety of ways, centre only, centre and plus outer rim, and also with printing on the back in the form of historical or informative text and limited edition numbering. 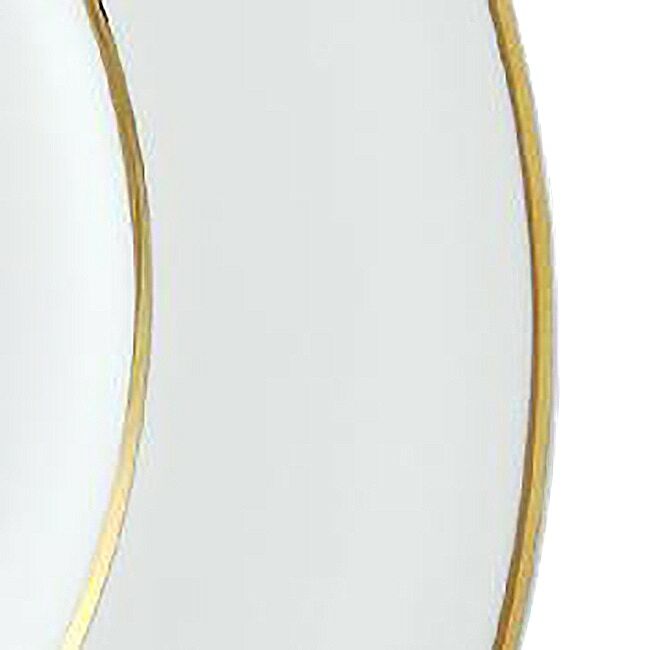 22ct gold or platinum silver lines on the rims and edges is an additional option. Historical and informative text on the back of the plate ensures that the memory of the event lives on through the ensuing years, and limited edition numbering lends extra value for the future collectors of memorabilia. 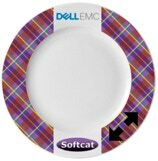 Artwork can be in the form of hand drawings to computer artwork and photos. Black and white, sepia or colour photographs can also be reproduced, and we can offer a comprehensive and competitive artwork service. 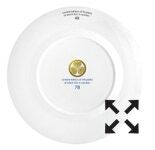 A minimum print run is usually 25 plates. We can quote for fewer. 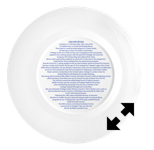 Click on the arrows bottom right of each plate to enlarge each image for more detail. 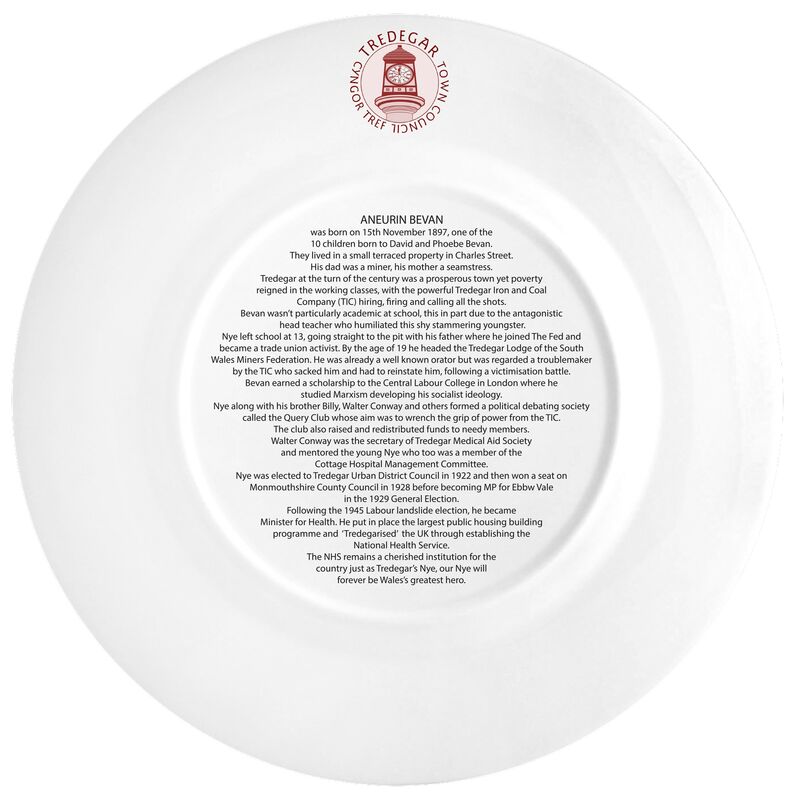 The examples show various texts and graphics which can be applied to the backs of the plates, and suggested positions and text for limited edition numbering. 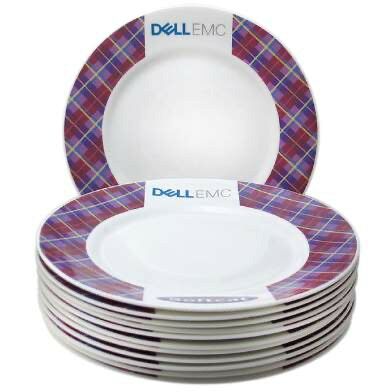 We are often asked if we produce one - off printed plates, or smaller print runs rather than the print runs of 25+ for which we normally quote. 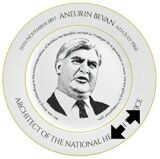 The answer is yes, but bear in mind that a one off and lower quantities carry the cost of the initial artwork (£35 - £55) and studio print set up (£45 - £55) before the cost of plate production, postage and VAT. So if you wish to have a quote bear this in mind. Even though it may seem expensive, remember, what you will have are original and unique pieces. 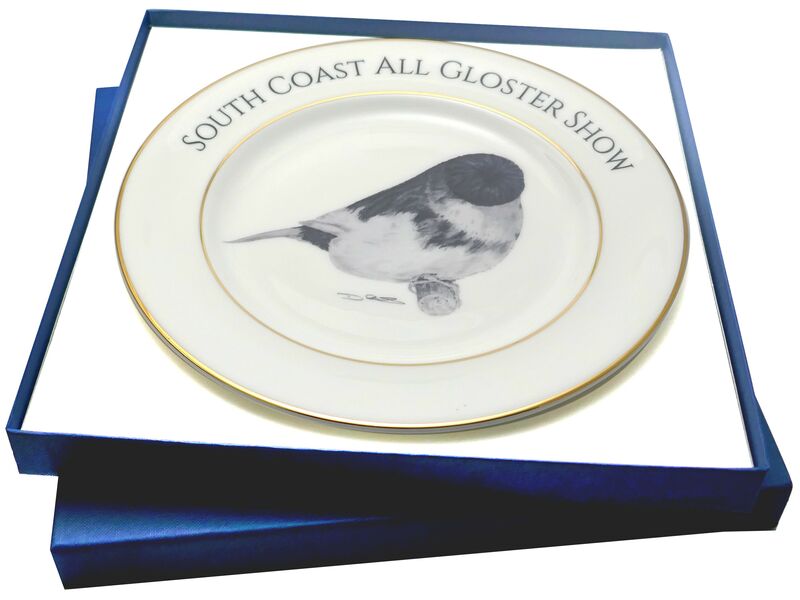 Presentation boxes are made to order, and can be foil blocked with a silver or gold leaf impressed logo. 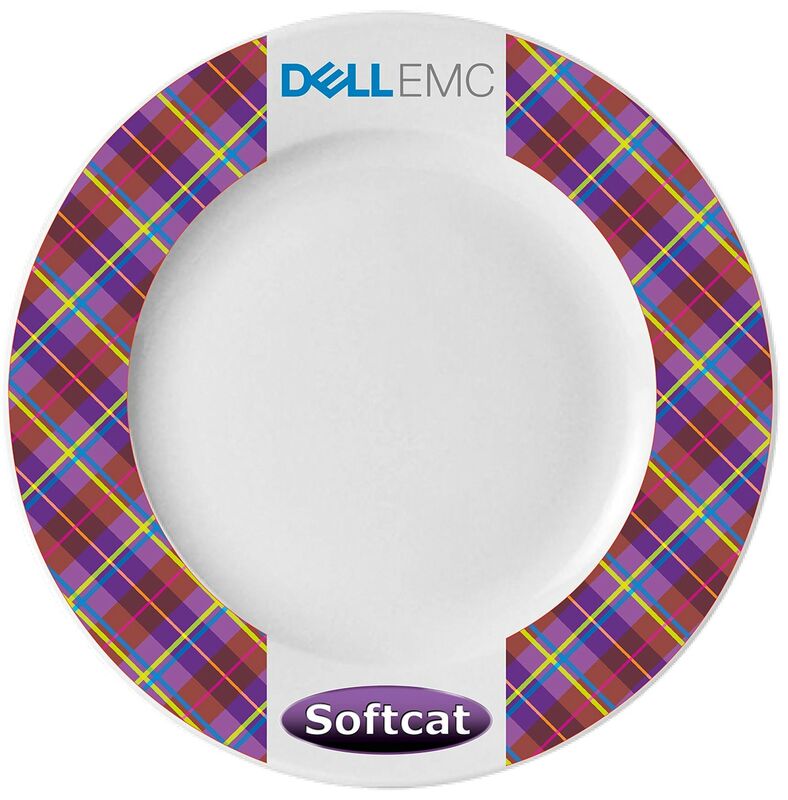 They are available with various colours for the outer bindings and the internal platform can be in white or black. There are also single colour foil blocking options. There is a one-off cost for the manufacture of a blocking die. 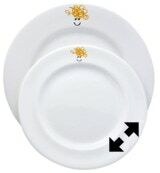 Choose a plate size (6” : 9” : 10.5” : 12”) diameter) let us know the quantity required then send us your artwork files and required positions of the artwork or a scanned sketch for centre only, centre plus edge, text or graphics on the plate back - limited edition numbering with your original shape, and graphics for the pump clip or beer handle. 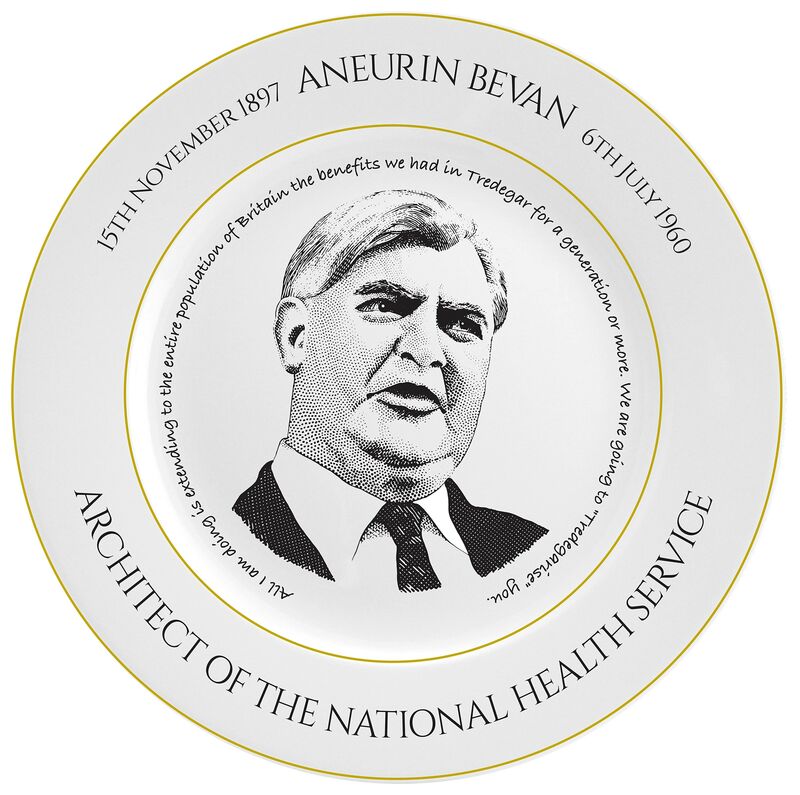 Artwork: Please supply computer compatible files - email artwork examples - phone if further advice is required. For spot colour and 4 colour process file types include: .pdf or .eps (with fonts as paths or outlines) Illustrator .ai, InDesign or Word, include Pantone spot colour references. opened in Photoshop. If these are larger than 4mb then send using DropBox, WeTransfer, Filemail or similar FTP File Transfer Protocol providers, who can accommodate attached larger files than most emails can handle. icon which will take you the site which shows how to install them. 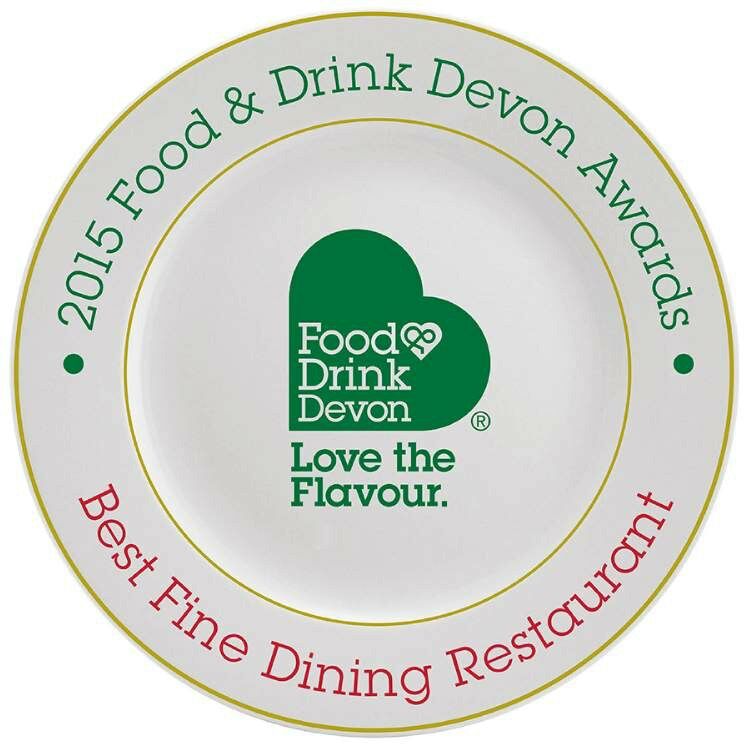 (UK) and we will be happy to answer any questions you may have. 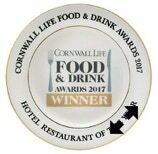 Or email us - using the button below. 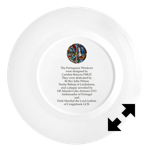 Family crests and coats of arms can be printed not only on plates but also a wide range of other bone china pottery for that extra prestige in your home or “castle”. Click on the arrows of each picture to magnify the image for more detail. 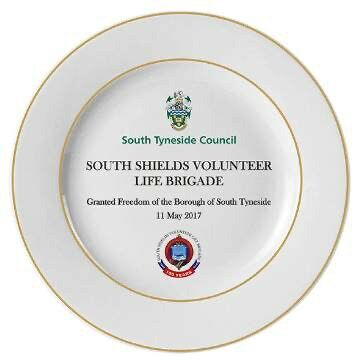 Life-saving group awarded Freedom of the Borough in South Tyneside 11 May 2017. 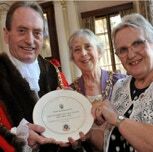 A long-serving group of local heroes have been awarded the Freedom of the Borough after their life-saving efforts were recognised. 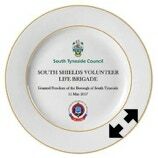 South Shields Volunteer Life Brigade (SSVLB) have had their work honoured by being handed one of the most prestigious civic awards. 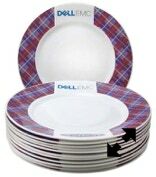 Plates with tartan edge design using full colour process 300dpi ceramic enamel for a corporate dining set. 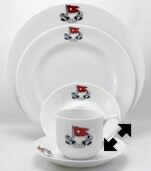 Part of a place setting with the White Star emblem for a themed restaurant based on the dining room of the Titanic. 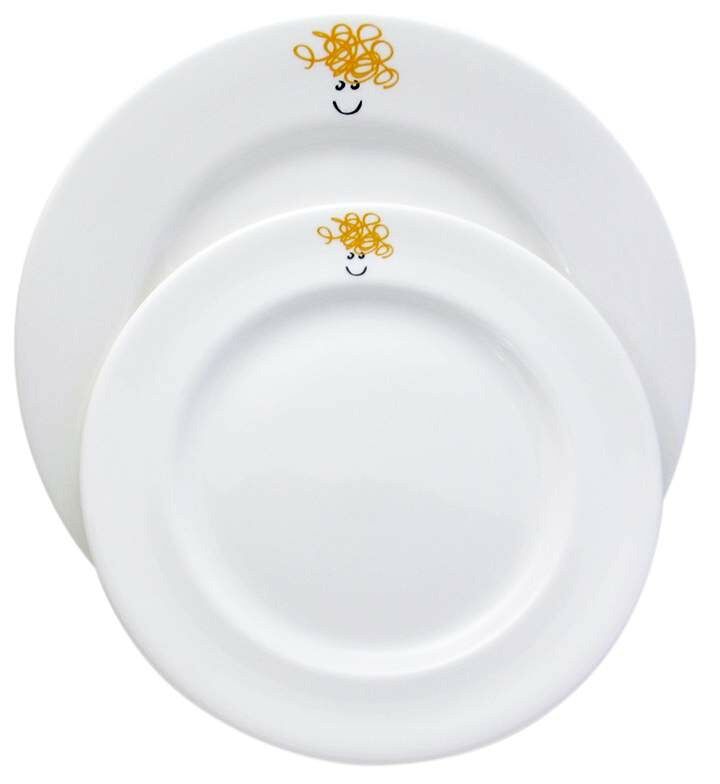 Plates for Ragdoll Productions creators of the Teletubbies and the Twirlywoos. 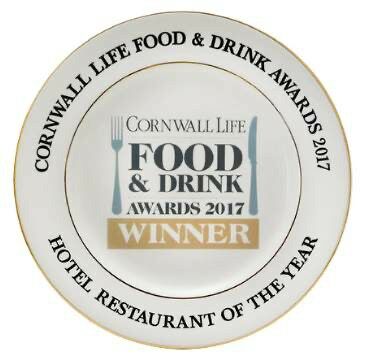 Plates are ideal for food and restaurant awards. 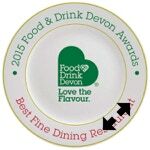 We can produce a standard award background and then add award names and categories to personalise each one.